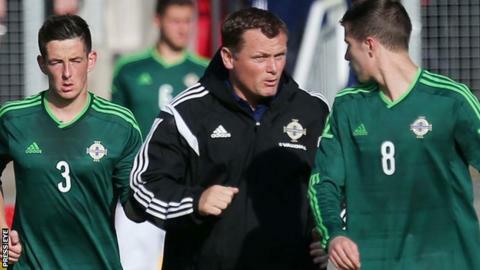 Northern Ireland got their first point on the board in qualifying for the 2017 European Under-21 Championship with a 1-1 draw in Iceland. The Irish lost 2-1 to Scotland in their opening fixture on Saturday, while Iceland beat France to top Group Three. But the visitors got off to a perfect start when Stevenage defender Ryan Johnson headed home a Darren McKnight corner after two minutes in Reykjavik. Aron Elis Thrandarson levelled after a poor Lewis Maloney backpass. The Northern Irish may look back on missed chances when they led 1-0 with McKnight and Ryan McLaughlin being denied by Iceland goalkeeper Frederik Schram and Michael Duffy also squandering a decent opportunity. In the second half, Northern Ireland's Mikhail Kennedy was denied by another fine save by Schram, although the Irish were indebted to a bad miss from Elias Mar Omarsson to ensure they came away with a point.